NoScript 2.0.4 has been released yesterday, with some bug fixes and one main addition: strict X-Content-Type-Options: nosniff enforcement. Nevertheless, X-Content-Type-Options offers a nice opportunity to further hardening, by allowing web sites to opt-in for the strictest checks, on more file types and also same-domain, in a theoretically compatible way. 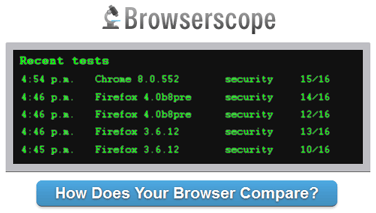 For those who don't know it, Browserscope is a project which aims at profiling and comparing browser capabilities, with a special eye for security features. By comparison, only Google Chrome boasts a higher score of 15/16, because it supports both the HTTP Origin Header and the HTML 5 Sandbox Attribute, which are not implemented yet by Firefox nor by NoScript. For the curious, "vanilla" Firefox 4 nightlies stop at 11/15 (even if you're going to read 12/15 because of a XSS test bug), Firefox 3.6.12 + NoScript is at 13/15, while disabling NoScript makes it fall down to 9/16 (reported as 10/16 because of the aforementioned bug). However, a fair comparison would need to cover also Content Security Policies, a very powerful and flexible security technology developed by Mozilla (test should be added soon, it seems) and countermeasures for cross-zone CSRF attacks (e.g. against routers), which are currently provided by NoScript and, partially, by Opera (Mozilla is working on something, too)*. If and when these features get tested, Firefox 4 + NoScript will lead at 16/18, followed by Chrome at 15/18. * I won't advocate including tests for other non-blocking security features provided by NoScript, such as ClearClick anti-Clickjacking, because they're not suitable for web-based automation. 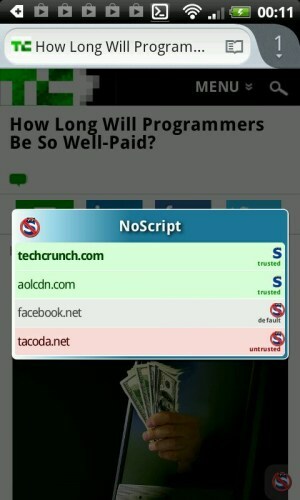 Firefox 4 + NoScript scores 15/17 now! Senior NoScript community contributor Grumpy Old Lady finally sent me a link to these notes, taken live at BlackHat USA during Graig Heffner's "How to Hack Millions of Routers" talk, and to the tool he released, allowing to remotely control the many models of routers found vulnerable to a specific kind of DNS Rebinding attack. Since I couldn't attend the L.A. conference, I've been anxiously in search of something like that to confirm al_9x's speculative forecast, i.e. that the exploited vulnerability was about routers exposing their administrative interface to the LAN on their WAN IP (even if remote administration is explicitly disabled), and now I'm delighted to find he was entirely correct! Some clarifications are still needed, though. XSS, thanks to its "Injection Checker", the first anti-XSS filter ever released in a web browser. Clickjacking -- NoScript's ClearClick feature is still the only effective protection entirely implemented inside the browser and requiring no server-side cooperation. CSRF (and especially, by default, cross-zone attacks against intranet resources) via the ABE module.